Initially focused on suborbital spaceflight, the company has designed, built and flown multiple testbeds of its New Shepard spacecraft at its facilities in Culberson County, Texas. Developmental test flights of the New Shepard, named after the first American in space Alan Shepard, began in April 2015, and flight testing continued into 2018, with its first passenger-carrying spaceflight planned for 2019. On nearly every one of the test flights since 2015, the uncrewed vehicle has reached a test altitude of more than 100 km (330,000 ft) and achieved a top speed of more than Mach 3 (3,675 km/h; 2,284 mph), reaching space above the Kármán line, with both the space capsule and its rocket booster successfully soft landing, making reuse possible. By 2016, the second New Shepard booster test article had made four flights, each time exceeding 100 km (330,000 ft) in altitude, before returning for successful soft landings. Blue Origin has become a part of a "dramatic metamorphosis" of the space industry in recent years, having moved into the orbital spaceflight technology business in 2014, initially as a rocket engine supplier for others via a contractual agreement to build a new large rocket engine, the BE-4, for major US launch system operator United Launch Alliance (ULA). ULA is also considering the BE-3, Blue Origin's smaller rocket engine used on New Shepard, for use in a new second stage—the Advanced Cryogenic Evolved Stage (ACES)—which will become the primary upper stage for ULA's Vulcan orbital launch vehicle in the 2020s. By 2015, Blue Origin had announced plans to also manufacture and fly its own orbital launch vehicle from the Florida Space Coast, known as the New Glenn. BE-4 had been expected to complete engine qualification testing by late 2018, but the test program continued into 2019. Blue Origin's three vehicles as of late 2012: (1) Goddard subscale demonstrator, flight tested in 2006–2007, (2) early, subscale version of the suborbital New Shepard propulsion module (as flown in 2011; variations exist to the larger New Shepard that actually flew in 2015), (3) future Space Vehicle (on top of a future orbital launch vehicle which, when stacked, is Blue Origin's future Orbital Transportation System). Blue Origin founder Jeff Bezos had been interested in space from an early age. A profile published in 2013 described a 1982 Miami Herald interview Bezos gave after he was named valedictorian of his high school class. The 18-year-old Bezos said he wanted "to build space hotels, amusement parks and colonies for 2 million or 3 million people who would be in orbit. 'The whole idea is to preserve the earth' he told the newspaper ... The goal was to be able to evacuate humans. The planet would become a park." In 1999, after watching the rocketry biopic film October Sky, Bezos discussed with science-fiction author Neal Stephenson the idea of forming a space company. Blue Origin was founded in 2000 in Kent, Washington, and began developing both rocket propulsion systems and launch vehicles. Since the founding, the company was very secretive about its plans and emerged from its "self-imposed silence" only after 2015. While the company was formally incorporated in 2000, its existence became public only in 2003, when Bezos began buying land in Texas, and interested parties followed up on the purchases. This was a topic of some interest in local politics, and Bezos' rapid aggregation of lots under a variety of whimsically named shell companies was called a "land grab". From 2003 to 2017, Blue Origin was led by its president, Rob Meyerson. Now Senior Vice President, Meyerson leads the Advanced Development Program business. In July 2013, the company employed approximately 250 people. By May 2015, they had grown to approximately 400 employees, with 350 of those working on engineering, manufacturing and business operations in the Kent location and approximately 50 in Texas supporting the engine-test and suborbital test-flight facility. By April 2017, the company had more than 1000 employees. In August 2018, the company was more than 1500 employees, more than double the number in early 2016, and is "expected to double again by the time New Glenn is flying." As of 2016, Blue Origin was spending US$1 billion a year, funded by Jeff Bezos' sales of Amazon stock. In both 2017, and again in 2018, Bezos made public statements that he intends to fund Blue Origin with US$1 billion per year from sales of his equity in Amazon. As early as 2005, Bezos had discussed plans to create a vertical-takeoff and landing spaceship called New Shepard. Plans for New Shepard were initially kept quiet, but Blue Origin's website indicated Bezos' desire to, "lower the cost of spaceflight so that ... we humans can better continue exploring the solar system." By 2008, a publicized timetable for New Shepard indicated that Blue Origin intended to fly unmanned in 2011, and manned in 2012. In a 2011 interview, Bezos indicated that he founded Blue Origin to send customers into space by focusing on two objectives: to decrease the cost and to increase the safety of human spaceflight. By July 2014, Bezos had invested over US$500 million of his own money into Blue Origin. The first developmental test flight of the New Shepard occurred on 29 April 2015. The uncrewed vehicle flew to its planned test altitude of more than 93.5 km (307,000 ft) and achieved a top speed of Mach 3 (3,675 km/h; 2,284 mph). In July 2015, NanoRacks, a provider of services such as payload design and development, safety approvals, and integration, announced a partnership with Blue Origin to provide standardized payload accommodations for experiments flying on Blue Origin's New Shepard suborbital vehicle. As of late 2016, Blue Origin projected that if all test flights operate as scheduled, they could begin flying passengers to space on the New Shepard in 2018. In September 2014, the company and United Launch Alliance (ULA) entered into a partnership whereby Blue Origin would produce a large rocket engine—the BE-4—for the Vulcan, the successor to the 10,000–19,000-kilogram-class (22,000–42,000 lb) Atlas V which has launched US national security payloads since the early 2000s, and will exit service in the late 2010s. The 2014 announcement added that Blue Origin had been working on the engine for three years prior to the public announcement, and that the first flight on the new rocket could occur as early as 2019. By April 2017, development and test of the 2,400 kN (550,000 lbf) BE-4 were progressing well and Blue Origin was expected to be selected for the ULA Vulcan rocket. In April 2015, Blue Origin announced that it had completed acceptance testing of the BE-3 rocket engine that would power the New Shepard space capsule to be used for Blue Origin suborbital flights. On 23 November 2015, Blue Origin launched the New Shepard rocket to space for a second time to an altitude of 100.53 km (329,839 ft), and vertically landed the rocket booster less than 1.5 metres (5 ft) from the center of the pad. The capsule descended to the ground under parachutes 11 minutes after blasting off and landed safely. This was the first time a suborbital booster had flown to space and returned to Earth. This flight validated the vehicle architecture and design. The ring fin shifted the center of pressure aft to help control reentry and descent; eight large drag brakes deployed and reduced the vehicle's terminal speed to 623 km/h (387 mph); hydraulically actuated fins steered the vehicle through 192 km/h (119 mph) high-altitude crosswinds to a location precisely aligned with and 1,500 m (5,000 ft) above the landing pad; then the highly throttleable BE-3 engine re-ignited to slow the booster as the landing gear deployed, and the vehicle descended the last 30 m (100 ft) at 7.1 km/h (4.4 mph) to touchdown on the pad. On 22 January 2016, Blue Origin re-flew the same New Shepard booster that launched and landed vertically in November 2015, demonstrating reuse. This time, New Shepard reached an apogee of 101.7 km (333,582 ft) before both capsule and booster returned to Earth for recovery and reuse. In April 2016, the same New Shepard booster again flew, now for a third time, reaching 103.4 km (339,178 ft), before again returning and landing successfully. In September 2015, Blue Origin announced details of an unnamed planned orbital launch vehicle, indicating that the first stage would be powered by its BE-4 rocket engine currently under development, while the second stage would be powered by its recently completed BE-3 rocket engine. In addition, Blue Origin announced that it would both manufacture and launch the new rocket from the Florida Space Coast. No payload or gross launch weight was given. Bezos noted in interviews that this new launch vehicle would not compete for US government national security missions, leaving that market to United Launch Alliance and SpaceX. Science-fiction author Neal Stephenson worked part-time at Blue Origin into late 2006 and credited the company's employees for ideas and discussions leading to his 2015 novel, Seveneves. In March 2016, Blue Origin invited journalists to see the inside of its Kent, Washington headquarters and manufacturing facility for the first time. The company was planning for substantial growth in 2016 as it planned to build more crew capsules and propulsion modules for the New Shepard program and ramp up BE-4 engine builds to support full-scale development testing. Blue indicated that employment was expected to grow to 1,000 in 2016 from 600 in February 2016. Bezos also articulated a long-term vision for humans in space, seeing the potential to move much heavy industry completely off-Earth, "leaving our planet zoned strictly for 'residential and light industrial' use with an end state hundreds of years out "where millions of people would be living and working in space." In March 2016, test flights carrying human occupants were possible as early as 2017, potentially with commercial service in 2018. Also in March 2016, Bezos discussed his plans to offer space tourism services to space. Pointing out the "entertainment" aspect of the early "barnstormers" in really advancing aviation in the early days when such rides "were a big fraction of airplane flights in those early days," he sees space tourism playing a similar role: advancing "space travel and rocket launches, through tourism and entertainment." On the other hand, there are no current plans to pursue the niche market of US military launches; Bezos has said he is unsure where Blue Origin would add any value in that market. In June 2018, Blue Origin indicated that while it continued to plan to fly initial internal passengers later in 2018, it would not be selling commercial tickets for New Shepard until 2019. In September 2016, Blue announced that its orbital rocket would be named New Glenn in honor of the first American astronaut to orbit the Earth, John Glenn, and that the 7-meter-diameter (23 ft) first stage will be powered by seven Blue Origin BE-4 engines. The first stage is reusable and will land vertically, just like the New Shepard suborbital launch vehicle that preceded it. At the time of the announcement of New Glenn, Bezos revealed that the next project beyond New Glenn would be New Armstrong, without detailing what that would be. In March 2017, Bezos announced that Blue Origin had acquired its first paying launch customer for orbital satellite launches. Eutelsat is expected to start launching TV satellites in 2022 on Blue Origin's New Glenn orbital launch vehicle. A day after announcing Eutelsat, Blue Origin introduced OneWeb as its second customer. In September 2017, Blue Origin closed a deal for New Glenn with its first Asian customer, Mu Space. The company, based in Thailand, plans to provide satellite-based broadband services and space travel in Asia-Pacific. In December 2017, Blue Origin launched a test experiment on New Shepard with a technology that could one day treat chest trauma in a space environment. Blue Origin has a development facility near Seattle, Washington, and an operational launch facility in West Texas, where they also test rocket engines. Blue Origin has continued to expand its Seattle-area office and rocket production facilities in 2016—purchasing an adjacent 11,000 m2 (120,000 sq ft)-building—and 2017, with permits filed to build a new 21,900 m2 (236,000 sq ft) warehouse complex and an additional 9,560 m2 (102,900 sq ft) of office space. Blue Origin manufactures rocket engines, launch vehicles, and space capsules in Washington. Its largest engine – BE-4 – will be produced at a new manufacturing facility currently being built in Alabama, announced in 2017 but with groundbreaking occurring only in January 2019. In 2017, Blue Origin established a manufacturing facility for launch vehicles in Florida near where they will launch New Glenn from the Cape Canaveral Air Force Station, after initiating design and construction in 2015. Blue Origin's first flight test vehicle, called Charon after Pluto's moon, was powered by four vertically mounted Rolls-Royce Viper Mk. 301 jet engines rather than rockets. The low-altitude vehicle was developed to test autonomous guidance and control technologies, and the processes that the company would use to develop its later rockets. Charon made its only test flight at Moses Lake, Washington on 5 March 2005. It flew to an altitude of 96 m (316 ft) before returning for a controlled landing near the liftoff point. Charon is currently on display at The Museum of Flight in Seattle, Washington. The next test vehicle, named the Goddard (also known as PM1), first flew on 13 November 2006. The flight was successful. A test flight for December 2 never launched. According to Federal Aviation Administration records, two further flights were performed by Goddard. Blue Origin's New Shepard suborbital spaceflight system is composed of two vehicles: a crew capsule accommodating three or more astronauts launched by a rocket booster. The two vehicles lift off together and are designed to separate during flight. After separation, the booster is designed to return to Earth to perform a vertical landing while the crew capsule follows a separate trajectory, returning under parachutes for a land touchdown. Both vehicles are intended for recovery and re-use. New Shepard is controlled entirely by on-board computers. In addition to flying astronauts, New Shepard is intended to provide frequent opportunities for researchers to fly experiments into suborbital space. A Federal Aviation Administration NOTAM indicated that a flight test of an early suborbital test vehicle – PM2 – was scheduled for 24 August 2011. The flight in west Texas failed when ground personnel lost contact and control of the vehicle. Blue Origin released its analysis of the failure nine days later. As the vehicle reached a speed of Mach 1.2 (1,470.1 km/h; 913.4 mph) and 14 km (46,000 ft) altitude, a "flight instability drove an angle of attack that triggered [the] range safety system to terminate thrust on the vehicle". In October 2012, Blue Origin conducted a successful New Shepard pad escape test at its West Texas launch site, firing its pusher escape motor and launching a full-scale crew capsule from a launch vehicle simulator. The crew capsule traveled to an altitude of 703 m (2,307 ft) under active thrust vector control before descending safely by parachute to a soft landing 500 m (1,630 ft) downrange. In April 2015, Blue Origin announced its intent to begin autonomous test flights of New Shepard in 2015 as frequently as monthly. Blue Origin expected "a series of dozens of flights over the extent of the test program [taking] a couple of years to complete". On 23 November 2015, New Shepard made its second test flight, reaching 100.5 km (330,000 ft) altitude with a successful vertical landing and recovery of the booster, the first time a booster stage that had been to space had ever done so. The crew capsule was also successfully recovered via parachute return, as Blue had done before. On 22 January 2016, Blue Origin re-flew the same New Shepard booster that launched and landed vertically in November 2015, demonstrating reuse. This time, New Shepard reached an apogee of 101.7 km (333,582 ft) before both capsule and booster again successfully returned to Earth with a soft landing for recovery and reuse. Additional flights of New Shepard propulsion module 2 (NS2) were flown on 2 April 2016, reaching 103.4 km (339,178 ft), and on 19 June 2016 for a fourth time, again reaching over 100.6 km (330,000 ft), before again returning and landing successfully. . A fifth and final test flight of NS2 took place in October 2016 before NS2 was retired. The first flight of the third booster took place in December 2017. The New Glenn is a 7-metre (23 ft)-diameter two stage orbital launch vehicle that is expected to launch prior to 2020. The design work on the vehicle began in 2012. The high-level specifications for the vehicle were publicly announced in September 2016. The first stage will be powered by seven BE-4 engines, also designed and manufactured by Blue Origin. The first stage is reusable, just like the New Shepard suborbital launch vehicle that preceded it. The second stage is intended to be expendable. Revealed in 2015, the Blue Origin orbital launch vehicle—which began to be referred to by the placeholder name of "Very Big Brother" in March 2016—is a two-stage-to-orbit liquid-propellant rocket. The launcher is intended to be reusable. In January 2016, Blue Origin announced that they plan to announce details about the launch vehicle later in 2016, and a few details were released in March 2016 when Blue Origin indicated that the first orbital launch was expected, from the Florida launch facility, in 2020. The first stage is to be powered by Blue Origin's BE-4 single-shaft oxygen-rich staged combustion liquid methane/liquid oxygen rocket engine while the second stage will be powered by the recently qualified BE-3 tap-off cycle liquid hydrogen/liquid oxygen rocket engine. The number of engines powering each stage has not been released, nor has the payload or gross launch weight specifications. No details were publicly released as of September 2015. Blue Origin intends to launch the rocket from the historic Launch Complex 36, and manufacture the rockets at a new facility on nearby land in Exploration Park. Acceptance testing of the BE-4 engines will also be done in Florida. Blue Origin began developing systems for orbital human spacecraft prior to 2012. A reusable first-stage booster was projected to fly a suborbital trajectory, taking off vertically like the booster stage of a conventional multistage rocket. Following stage separation, the upper stage would continue to propel astronauts to orbit while the first-stage booster would descend to perform a powered vertical landing similar to the New Shepard suborbital Propulsion Module. The first-stage booster would be refueled and launched again, allowing improved reliability and lowering the cost of human access to space. The booster rocket was projected to loft Blue Origin's biconic Space Vehicle to orbit, carrying astronauts and supplies. After orbiting the Earth, the Space Vehicle will reenter Earth's atmosphere to land on land under parachutes, and then be reused on future missions to Earth orbit. Blue Origin successfully completed a System Requirements Review (SRR) of its orbital Space Vehicle in May 2012. Engine testing for the Reusable Booster System (RBS) vehicle began in 2012. A full-power test of the thrust chamber for Blue Origin BE-3 liquid oxygen, liquid hydrogen rocket engine was conducted at a NASA test facility in October 2012. The chamber successfully achieved full thrust of 100,000 pounds-force (about 440 kN). 19 June 2016 New Shepard 2 Successful sub-orbital flight and landing of a reused booster: The fourth launch and landing of the same rocket. Blue Origin published a live webcast of the takeoff and landing. 5 October 2016 New Shepard 2 Successful sub-orbital flight and landing of a reused booster: The fifth and final launch and landing of the same rocket (NS2). The capsule separated when the rocket was at max Q to test the abort sequence in most extreme circumstances; unexpectedly, besides the capsule, the booster was also recovered despite the stress suffered at separation. 12 December 2017 New Shepard 3 Successful sub-orbital flight and landing. The first launch of NS3 and new Crew Capsule 2.0. 29 April 2018 New Shepard 3 Sub-orbital flight and landing, second launch of NS3. First flight with a commercial cargo payload of suborbital experiments, and first flight to be licensed by the FAA with a standard commercial launch license rather than under an experimental permit. Capsule peaked at 105.9 kilometres (65.8 mi) altitude. 18 July 2018 New Shepard 3 Ninth flight overall, and third of NS3, included several customer payloads. Before reaching the apogee, the capsule engaged an abort sequence to test its stabilization modules, after which it reached 120 kilometres (393,000 ft). 22 January 2019 New Shepard 3 Tenth flight overall, and fourth of NS3, included several customer payloads. Blue Engine 1, or BE-1, was the first rocket engine developed by Blue Origin and was used on the company's Goddard development vehicle. The pressure-fed monopropellant engine was powered by peroxide and produced 9.8 kN (2,200 lbf) of thrust. Blue Engine 2, or BE-2, was a pump-fed bipropellant engine burning kerosene and peroxide which produced 140 kN (31,000 lbf) of thrust. Five BE-2 engines powered Blue Origin's PM-2 development vehicle on two test flights in 2011. 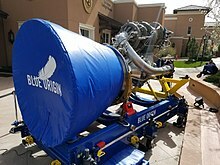 Blue Origin publicly announced the development of the Blue Engine 3, or BE-3, in January 2013, but the engine had begun development in the early 2010s. BE-3 is a new liquid hydrogen/liquid oxygen (LH2/LOX) cryogenic engine that can produce 490 kN (110,000 lbf) of thrust at full power, and can be throttled down to as low as 110 kN (25,000 lbf) for use in controlled vertical landings. Early thrust chamber testing began at NASA Stennis in 2013. By late 2013, the BE-3 had been successfully tested on a full-duration suborbital burn, with simulated coast phases and engine relights, "demonstrating deep throttle, full power, long-duration and reliable restart all in a single-test sequence." NASA has released a video of the test. As of December 2013[update], the engine had demonstrated more than 160 starts and 9,100 seconds (2.5 h) of operation at Blue Origin's test facility near Van Horn, Texas. BE-3 engine acceptance testing was completed by April 2015 with 450 test firings of the engine and a cumulative run time of more than 30,000 seconds (8.3 h). The BE-3 engine powers the New Shepard space capsule that is being used for Blue Origin suborbital flights that began in 2015. The BE-3U engine is a modified BE-3 for use on upper stages of Blue Origin orbital launch vehicles. The engine will include a nozzle better optimized for operation under vacuum conditions as well as a number of other manufacturing differences since it is an expendable engine whereas the BE-3 is designed for reusability. BE-4 rocket engine, on display at the 34th Space Symposium, April 2018. It was the first BE-4 to be hotfire tested, on 18 October 2017. Blue Origin began work on a new and much larger rocket engine in 2011. The new engine, the Blue Engine 4, or BE-4, is a change for Blue Origin in that it is their first engine that will combust liquid oxygen and liquid methane propellants. The engine has been designed to produce 2,400 kN (550,000 lbf) of thrust, and was initially planned to be used exclusively on a Blue Origin proprietary launch vehicle. Blue Origin did not announce the new engine to the public until September 2014. In late 2014, Blue Origin signed an agreement with United Launch Alliance (ULA) to co-develop the BE-4 engine, and to commit to use the new engine on an upgraded Atlas V launch vehicle, replacing the single RD-180 Russian-made engine. The new launch vehicle will use two of the 2,400 kN (550,000 lbf) BE-4 engines on each first stage. The engine development program began in 2011. When announced in 2014, and still in March 2016, ULA expected the first flight of the new launch vehicle—the Vulcan—no earlier than 2019. As of March 2018, Blue intends to complete engine qualification testing by late 2018, but no date for the first launch event has been recently stated by ULA. Blue Origin partnered with Aerojet Rocketdyne to develop a pusher launch escape system for the New Shepard suborbital Crew Capsule. Aerojet Rocketdyne provides the Crew Capsule Escape Solid Rocket Motor (CCE SRM) while the thrust vector control system that steers the capsule during an abort is designed and manufactured by Blue Origin. In late 2012, Blue Origin performed a pad abort test of the escape system on a full-scale suborbital capsule. Four years later in 2016, the escape system was successfully tested in-flight at the point of highest dynamic pressure as the vehicle reached transonic velocity. By July 2014, Jeff Bezos had invested over US$500 million into Blue Origin. Even by March 2016, the vast majority of funding to support technology development and operations at Blue Origin has come from Jeff Bezos' private investment, but Bezos had declined to publicly state the amount prior to 2017 when an annual amount was stated publicly. Blue Origin has also completed work for NASA on several small development contracts, receiving total funding of US$25.7 million by 2013. As of April 2017[update], Bezos is selling approximately US$1 billion in Amazon stock each year to privately finance Blue Origin. Bezos placed that in context in 2019 saying "I want to take the assets that I have from Amazon and translate that into the heavy-lifting infrastructure that will [help] the next generation to have dynamic entrepreneurialism in space - kind of build that transportation network. That's what's going on, that's what Blue Origin's mission is." Blue Origin has contracted to do work for NASA on several development efforts. The company was awarded US$3.7 million in funding in 2009 by NASA via a Space Act Agreement under the first Commercial Crew Development (CCDev) program for development of concepts and technologies to support future human spaceflight operations. NASA co-funded risk-mitigation activities related to ground testing of (1) an innovative ‘pusher’ escape system, that lowers cost by being reusable and enhances safety by avoiding the jettison event of a traditional ‘tractor’ Launch Escape System, and (2) an innovative composite pressure vessel cabin that both reduces weight and increases safety of astronauts. This was later revealed to be a part of a larger system, designed for a biconic capsule, that would be launched atop an Atlas V rocket. On 8 November 2010, it was announced that Blue Origin had completed all milestones under its CCDev Space Act Agreement. In April 2011, Blue Origin received a commitment from NASA for US$22 million of funding under the CCDev phase 2 program. Milestones included (1) performing a Mission Concept Review (MCR) and System Requirements Review (SRR) on the orbital Space Vehicle, which utilizes a biconic shape to optimize its launch profile and atmospheric reentry, (2) further maturing the pusher escape system, including ground and flight tests, and (3) accelerating development of its BE-3 LOX/LH2 440 kN (100,000 lbf) engine through full-scale thrust chamber testing. In 2012, NASA's Commercial Crew Program released its follow-on CCiCap solicitation for the development of crew delivery to ISS by 2017. Blue Origin did not submit a proposal for CCiCap, but is reportedly continuing work on its development program with private funding. Blue Origin had earlier attempted to lease a different part of the Space Coast, when they submitted a bid in 2013 to lease Launch Complex 39A (LC39A) at the Kennedy Space Center—on land to the north of, and adjacent to, Cape Canaveral AFS—following NASA's decision to lease the unused complex out as part of a bid to reduce annual operation and maintenance costs. The Blue Origin bid was for shared and non-exclusive use of the LC39A complex such that the launchpad was to have been able to interface with multiple vehicles, and costs for using the launch pad were to have been shared across multiple companies over the term of the lease. One potential shared user in the Blue Origin notional plan was United Launch Alliance. A competing bid for commercial use of the LC39A launch complex was submitted by SpaceX, which submitted a bid for exclusive use of the launch complex to support their crewed missions. In September 2013—before completion of the bid period, and before any public announcement by NASA of the results of the process—Florida Today reported that Blue Origin had filed a protest with the U.S. General Accounting Office (GAO) "over what it says is a plan by NASA to award an exclusive commercial lease to SpaceX for use of mothballed space shuttle launch pad 39A". NASA had originally planned to complete the bid award and have the pad transferred by October 1, 2013, but the protest delayed a decision until the GAO reached a decision on the protest. SpaceX said that they would be willing to support a multi-user arrangement for pad 39A. In December 2013, the GAO denied the Blue Origin protest and sided with NASA, which argued that the solicitation contained no preference on the use of the facility as either multi-use or single-use. "The [solicitation] document merely [asked] bidders to explain their reasons for selecting one approach instead of the other and how they would manage the facility." In the event, NASA selected the SpaceX proposal in late 2013 and signed a 20-year lease contract for Launch Pad 39A to SpaceX in April 2014. Blue Origin cooperated[clarification needed] with Boeing in Phase 1 of the DARPA XS-1 spaceplane program. In September 2018, it was announced that Blue Origin's BE-4 engine had been selected by United Launch Alliance to provide first-stage rocket engines for ULA's next-generation booster design, the Vulcan rocket. The BE-4 engine is set to replace the Russian-built RD-180 currently powering ULA's Atlas 5. ^ Sheetz, Michael (18 April 2018). "Blue Origin's new rocket engine will be able to launch '100 full missions,' CEO says". Cnbc.com. Retrieved 9 October 2018. ^ a b Johnson, Eric M. (2 August 2018). "Bezos throws cash, engineers at rocket program as space race accelerates". Reuters. Retrieved 4 August 2018. 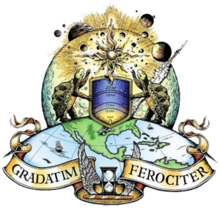 ^ a b "Gradatim Ferociter! Jeff Bezos explains Blue Origin's motto, logo … and the boots". GeekWire. 25 October 2016. Retrieved 25 January 2018. ^ "Blue Origin". Blue Origin. Retrieved 5 December 2013. ^ "Blue Origin Engineer Talks Next Steps for New Shepard, New Glenn". Space.com. Retrieved 25 January 2018. ^ "Jeff Bezos Says Blue Origin Will Put People in Space in 2019". Fortune. Retrieved 23 January 2019. ^ Palmer, Katie. "Jeff Bezos' Blue Origin Rocket Took Off and Landed—Again". Wired. Wired.com. Retrieved 22 January 2016. ^ a b c Calandrelli, Emily (2 April 2016). "Blue Origin launches and lands the same rocket for a third time". Retrieved 3 April 2016. ^ a b Grush, Loren (19 June 2016). "Blue Origin safely launches and lands the New Shepard rocket for a fourth time". Retrieved 19 June 2016. ^ Holmes, Mark (23 May 2018). "Jeff Bezos: Day One in the Space Industry". Via Satellite. Retrieved 24 May 2018. the industry has undergone a dramatic metamorphosis over the last few years. Nowhere has this been more apparent than in the launch market where SpaceX effected a revolution. Now, others are getting in on the act. Jeff Bezos [is now] launching rockets. ^ Gruss, Mike (13 April 2015). "ULA's Vulcan Rocket To be Rolled out in Stages". SpaceNews. Retrieved 17 April 2015. ^ a b Foust, Jeff (19 April 2018). "Blue Origin expects BE-4 qualification tests to be done by year's end". SpaceNews. Retrieved 21 April 2018. ^ "NasaTelevision: Commercial Crew Progress Status Update". Youtube.com. 9 January 2013. Retrieved 5 December 2013. ^ Whoriskey, Peter (11 August 2013). "For Jeff Bezos, a new frontier". Washington Post. Retrieved 3 October 2015. ^ Davenport, Christian (2018). The Space Barons: Elon Musk, Jeff Bezos, and the Quest to Colonize the Cosmos. PublicAffairs, an imprint owned by Hachette Book Group. ISBN 9781610398299. ^ Jeff Foust (26 March 2018). "Reviews: Rocket Billionaires and The Space Barons". The Space Review. ^ a b c d e de Selding, Peter B. (14 April 2017). "Blue Origin's older than SpaceX in more ways than one". Space Intel Report. Retrieved 15 April 2017. ^ a b Alan Boyle (June 24, 2006). "Blue's Rocket Clues". msnbc. Archived from the original on April 11, 2008. Retrieved May 28, 2008. ^ a b Foust, Jeff (7 December 2013). "Blue Origin shows off its engine". NewSpace Journal. Retrieved 10 December 2013. ^ Mylene Mangalindan (10 November 2006). "Buzz in West Texas is about Jeff Bezos space craft launch site". The Wall Street Journal. Retrieved 28 May 2008. ^ a b c d e Boyle, Alan (5 March 2016). "Jeff Bezos lifts curtain on Blue Origin rocket factory, lays out grand plan for space travel that spans hundreds of years". GeekWire. Retrieved 9 March 2016. ^ a b "Local engineers aim high for cheaper spaceflight". Seattle Times. 31 May 2015. Retrieved 1 June 2015. ^ a b c St. Fleur, Nicholas (5 April 2017). "Jeff Bezos Says He Is Selling $1 Billion a Year in Amazon Stock to Finance Race to Space". The New York Times. Retrieved 23 April 2017. ^ Jeff Bezos reveals what it's like to build an empire and become the richest man in the world — and why he's willing to spend $1 billion a year to fund the most important mission of his life, Business Insider, 28 April 2018, accessed 1 May 2018. ^ "Accidents Won't Stop Private Space Industry's Push to Final Frontier". WIRED. Retrieved 17 July 2018. ^ Michael Graczyk (March 15, 2005). "Blue Origin Spaceport Plans are Talk of Texas Town". space.com. Archived from the original on July 24, 2008. Retrieved May 28, 2008. ^ Levy, Stephen (13 November 2011). "Jeff Bezos Owns the Web in More Ways Than You Think". Wired. Retrieved 9 December 2011. ^ a b Foust, Jeff (18 July 2014). "Bezos Investment in Blue Origin Exceeds $500 Million". Space News. Retrieved 20 July 2014. ^ "Watch the incredible first test flight of Jeff Bezos's mysterious new rocket". Business Insider. Retrieved 17 July 2018. ^ a b Foust, Jeff. "Senior Staff Writer". Space News. Retrieved 5 May 2015. ^ Foust, Jeff (16 July 2015). "NanoRacks And Blue Origin Team To Fly Suborbital Research Payloads". SpaceNews. ^ Morris, David (15 October 2016). "Blue Origin Will Take Tourists to Space by 2018". Fortune.com. Retrieved 6 December 2016. ^ a b Achenbach, Joel (17 September 2014). "Jeff Bezos's Blue Origin to supply engines for national security space launches". Washington Post. Retrieved 27 September 2014. ^ a b c Foust, Jeff (13 April 2015). "Blue Origin's suborbital plans are finally ready for flight". Retrieved 18 April 2015. We’ve recently completed acceptance testing, meaning we’ve accepted the engine for suborbital flight on our New Shepard vehicle, [the end of a] very, very long development program [of] 450 test firings of the engine and a cumulative run time of more than 500 min [8.3 h]. The completion of those tests sets the stage for Blue Origin to begin test flights of the vehicle later this year at its facility in West Texas [where they] expect a series of flight tests with this vehicle ... flying in autonomous mode ... We expect a series of dozens of flights over the extent of the test program [taking] a couple of years to complete. ^ Chang, Kenneth. "Journalist". The New York Times. The New York Times. Retrieved 24 November 2015. ^ Cofeld, Calla. "Staff Witer". Space.com. Space.com. Retrieved 25 November 2015. ^ "Blue Origin Launches Bezos's Space Dreams and Lands a Rocket". Retrieved 17 July 2018. ^ Jeff, Bezos. "Historic Rocket Landing". 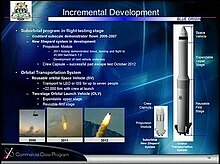 www.blueorigin.com. Blue Origin. Retrieved 23 November 2015. ^ a b c Foust, Jeff (15 September 2015). "Bezos Not Concerned About Competition, Possible ULA Sale". Space News. Retrieved 16 September 2015. ^ a b c Foust, Jeff (8 March 2016). "Blue Origin plans growth spurt this year". SpaceNews. Retrieved 13 March 2016. ^ Fedde, Corey (9 March 2016). "How Blue Origin plans to soon send people into space, safely". Christian Science Monitor. Retrieved 10 March 2016. ^ a b c Price, Wayne T. (12 March 2016). "Jeff Bezos' Blue Origin could change the face of space travel". Florida Today. Retrieved 13 March 2016. ^ Foust, Jeff (21 June 2018). "Blue Origin plans to start selling suborbital spaceflight tickets next year". SpaceNews. Retrieved 25 June 2018. ^ a b c d Bergin, Chris (12 September 2016). "Blue Origin introduce the New Glenn orbital LV". NASASpaceFlight.com. Retrieved 12 September 2016. ^ Samantha Masunaga (12 September 2016). "Blue Origin's new, more powerful rocket will compete with SpaceX". Los Angeles Times. ^ Cecilia King (7 March 2017). "Blue Origin, Jeff Bezos's Moon Shot, Gets First Paying Customer". The New York Times. ^ "Jeff Bezos adds OneWeb satellite venture to Blue Origin's New Glenn launch manifest". GeekWire. 8 March 2017. Retrieved 25 January 2018. ^ "The Rocket Company of Jeff Bezos Has Its First Asian Customer - Finance.co.uk- Breaking Financial News Updates From Around The World | Latest News Headlines". Finance.co.uk- Breaking Financial News Updates From Around The World | Latest News Headlines. 26 September 2017. Retrieved 25 January 2018. ^ "Blue Origin announces satellite launch deal with Thai telecom startup Mu Space". GeekWire. 26 September 2017. Retrieved 25 January 2018. ^ "NASA Funds Flight for Space Medical Technology on Blue Origin". link.galegroup.com. Retrieved 5 February 2018. ^ Stile, Marc (20 October 2016). "Bezos' rocket company, Blue Origin, is the new owner of an old warehouse in Kent". bizjournals.com. Puget Sound Business Journal. Retrieved 16 February 2017. ^ "Jeff Bezos' Blue Origin space venture has plans for big expansion of Seattle-area HQ". Geekwire.com. 22 February 2017. Retrieved 11 August 2017. ^ "Blue Origin will build its rocket engine in Alabama because the space industry is ruled by politics". The Verge. Retrieved 17 July 2018. ^ "Bezos' Blue Origin to build, launch rockets in Fla". USA TODAY. Retrieved 17 July 2018. ^ Boyle, Alan. "Amazon.com billionaire's 5-ton flying jetpack lands in Seattle museum". NBC News. Retrieved 2 February 2017. ^ a b "Blue Origin Charon Test Vehicle". The Museum of Flight. Retrieved 4 March 2013. ^ "Blue Origin's Original Charon Flying Vehicle Goes on Display at The Museum of Flight". The Museum of Flight. Archived from the original on March 28, 2013. Retrieved March 4, 2013. ^ "Blue Origin Charon Test Vehicle". Museum of Flight. Retrieved 6 August 2016. ^ Alan Boyle (November 28, 2006). "Blue Origin Rocket Report". cosmiclog.msnbc.msn.com. Archived from the original on April 15, 2008. Retrieved May 28, 2008. ^ Alan Boyle (December 2, 2006). "Blue Alert For Blastoff". cosmiclog.msnbc.msn.com. Archived from the original on May 7, 2008. Retrieved May 28, 2008. ^ "Launches". www.faa.gov. Retrieved 4 April 2019. ^ a b c "Blue Origin – About Blue". Archived from the original on March 25, 2013. Retrieved April 5, 2013. ^ "Blue Origin – Research". Archived from the original on April 13, 2013. Retrieved April 5, 2013. ^ Bezos, Jeff (September 2, 2011). "Successful Short Hop, Set Back, and Next Vehicle". Letter. Blue Origin. Archived from the original on September 2, 2011. Retrieved September 3, 2011. ^ a b c "Blue Origin Conducts Successful Pad Escape Test". Blue Origin. October 22, 2012. Archived from the original on December 15, 2013. Retrieved December 5, 2013. ^ "Bezos' Blue Origin completes first test flight of 'New Shepard' spacecraft". SpaceFlightNow. SpaceFlightNow. Retrieved 7 April 2019. ^ "Blue Origin Makes Historic Rocket Landing". Blue Origin. November 24, 2015. Archived from the original on November 25, 2015. Retrieved November 24, 2015. ^ a b Amos, Jonathan (24 November 2015). "New Shepard: Bezos claims success on second spaceship flight". BBC News. Retrieved 26 November 2015. ^ Dillow, Clay. "Reporter". Fortune.com. Fortune.com. Retrieved 22 January 2016. ^ Calandrelli, Emily. "Blue Origin releases video from third launch and landing of New Shepard". TechCrunch.com. Retrieved 4 April 2016. ^ Berger, Eric (9 March 2016). "Behind the curtain: Ars goes inside Blue Origin's secretive rocket factory". Ars Technica. Retrieved 9 March 2016. ^ a b Jeff Bezos plans to boost humans into space from Cape Canaveral, CBS News, accessed September 17, 2015. Bezos: "You cannot afford to be a space-fairing civilization if you throw the rocket away every time you use it. ... We have to be focused on reusability, we have to be focused on lowering the cost of space." ^ Bergin, Chris (22 January 2016). "Blue Origin conduct successful reuse test with New Shepard". NASASpaceFlight.com. Retrieved 25 January 2016. hope to share details about this first orbital vehicle this year. And launch and land our New Shepard rocket – again and again. ^ "Breaking News | ULA taps Blue Origin for powerful new rocket engine". Spaceflightnow.com. Retrieved 8 April 2015. ^ "Blue Origin Completes Spacecraft System Requirements Review". Retrieved 5 April 2013. ^ Graczyk, Michael (14 November 2006). "Private space firm launches 1st test rocket". Associated Press. Archived from the original on 7 January 2007. Retrieved 9 January 2007. ^ Boyle, Alan (March 23, 2007). "Rocket Revelations". MSNBC. Archived from the original on January 19, 2008. Retrieved January 29, 2008. ^ "Recently Completed/Historical Launch Data". FAA AST. Retrieved 3 February 2008. ^ "Recently Completed/Historical Launch Data". FAA AST. Retrieved 30 May 2011. ^ a b "Blue Origin has a bad day (and so do some of the media)". Retrieved 3 September 2011. ^ "Launch. Land. Repeat". Archived from the original on January 24, 2016. Retrieved January 23, 2016. ^ a b Foust, Jeff (5 October 2016). "Blue Origin successfully tests New Shepard abort system". SpaceNews. Retrieved 5 October 2016. ^ Blue Origin (6 October 2016). "Max Q In-Flight Escape (slow motion)". YouTube. Retrieved 9 October 2018. ^ "Jeff Bezos Shows Off What It's Like to Ride His New Rocket Capsule Into Space". Fortune.com. Retrieved 25 January 2018. ^ "Blue Origin will livestream its first test flight of 2018". Engadget.com. Retrieved 9 October 2018. ^ Blue Origin Launches New Shepard Space Capsule on Highest Test Flight Yet. Tariq Malik, Space. April 2018. ^ "Payload Manifest on Mission 9". Blueorigin.com. 17 July 2018. Retrieved 9 October 2018. ^ a b "Blue Origin Engines". Blue Origin. Retrieved 15 May 2018. ^ a b @jeff_foust (10 March 2018). "Rob Meyerson shows this chart of the various engines Blue Origin has developed and the vehicle that have used, or will use, them. #spaceexploration" (Tweet) – via Twitter. ^ Krebs, Gunter (29 April 2018). "New Shepard". Gunter's Space Page. Retrieved 15 May 2018. ^ a b c Messier, Doug (3 December 2013). "Blue Origin Tests New Engine in Simulated Suborbital Mission Profile". Parabolic Arc. Retrieved 5 December 2013. ^ "Updates on commercial crew development". NewSpace Journal. 17 January 2013. Retrieved 21 January 2013. ^ a b Messier, Doug (3 December 2013). "Video of Blue Origin Engine Test". Parabolic Arc. Retrieved 5 December 2013. ^ Blue Origin Tests New Engine, Aviation Week, 2013-12-09, accessed September 16, 2014. ^ a b c Ferster, Warren (17 September 2014). "ULA To Invest in Blue Origin Engine as RD-180 Replacement". Space News. Retrieved 19 September 2014. ^ "Aerojet Motor Plays Key Role in Successful Blue Origin Pad Escape". Aerojet Rocketdyne. Retrieved 14 May 2018. ^ "Aerojet Rocketdyne Motor Plays Key Role in Successful Blue Origin In-Flight Crew Escape Test". Aerojet Rocketdyne. Retrieved 14 May 2018. ^ a b c "Blue Origin Space Act Agreement" (PDF). Nasa.gov. Retrieved 5 December 2013. ^ a b Morring, Frank, Jr. (April 22, 2011). "Five Vehicles Vie To Succeed Space Shuttle". Aviation Week. Archived from the original on December 21, 2011. Retrieved February 23, 2011. the CCDev-2 awards, ... went to Blue Origin, Boeing, Sierra Nevada Corp. and Space Exploration Technologies Inc. (SpaceX). ^ Mosher, Dave (23 February 2019). "Jeff Bezos just gave a private talk in New York. From utopian space colonies to dissing Elon Musk's Martian dream, here are the most notable things he said". Business Insider. Retrieved 25 February 2019. ^ "Blue Origin Space Act Agreement, Amendment One" (PDF). NASA. Retrieved 5 December 2013. ^ "NASA Selects Commercial Firms to Begin Development of Crew Transportation Concepts and Technology Demonstrations for Human Spaceflight Using Recovery Act Funds". press release. NASA. 1 February 2010. Retrieved 2 February 2010. ^ Jeff Foust. "Blue Origin proposes orbital vehicle". Newspacejournal.com. Retrieved 5 December 2013. ^ "Commercial Crew Development (CCDev) Round One Companies Have Reached Substantial Hardware Milestones In Only 9 Months, New Images and Data Show" (PDF). Commercialspaceflight.com. Archived from the original (PDF) on April 21, 2012. Retrieved December 5, 2013. ^ "Blue Origin CCDev 2 Space Act Agreement" (PDF). Procurement.ksc.nasa.gov. Archived from the original (PDF) on February 15, 2013. Retrieved December 5, 2013. ^ "NASA announces $1.1 billion in support for a trio of spaceships". Cosmicclog.nbcnews.com. Retrieved 5 December 2013. ^ Matthews, Mark K. (18 August 2013). "Musk, Bezos fight to win lease of iconic NASA launchpad". Orlando Sentinel. Retrieved 21 August 2013. ^ a b Messier, Doug (10 September 2013). "Blue Origin Files Protest Over Lease on Pad 39A". Parabolic Arc. Retrieved 11 September 2013. ^ a b Messier, Doug (12 December 2013). "Blue Origin Loses GAO Appeal Over Pad 39A Bid Process". Parabolic Arc. Retrieved 13 December 2013. ^ Foust, Jeff (21 September 2013). "A minor kerfuffle over LC-39A letters". Space Politics. Retrieved 25 September 2013. ^ Dean, James (15 April 2014). "With nod to history, SpaceX gets launch pad 39A OK". Florida Today. Retrieved 16 September 2014. ^ "XS-1 Program to Ease Access to Space Enters Phase 2". Defense Advanced Research Projects Agency. Retrieved 16 May 2016. ^ "Bezos rocket engine selected for new Vulcan rocket – Spaceflight Now". spaceflightnow.com. Retrieved 28 September 2018. Wikimedia Commons has media related to Blue Origin.